The first thing to determine is what scale to build in. Since I didn't have a system I was building toward, I was free to choose whatever size I wanted. To make an informed choice, and to manage the potential array of ship sizes, I looked at the smallest ship I wanted to make, in this case destroyers. I settled on the size and then crunched the numbers and then rounded it to the nearest whole number. For this project, I settled on 1:1500. I own a physical copy of Jane's WWI Ships, so I decided to stick to that book's style and level of detail. With the scale sorted, I jumped on the computer to scan, scale, and print out some top-down deck plans. 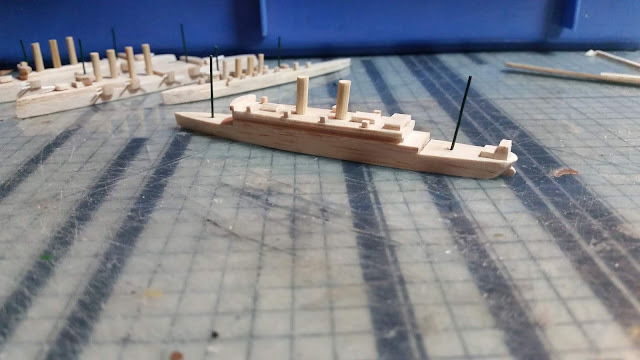 When I print out the plans, I always print several extra top-downs so that I have a complete set for reference and the spares for cutting out the hull pieces. 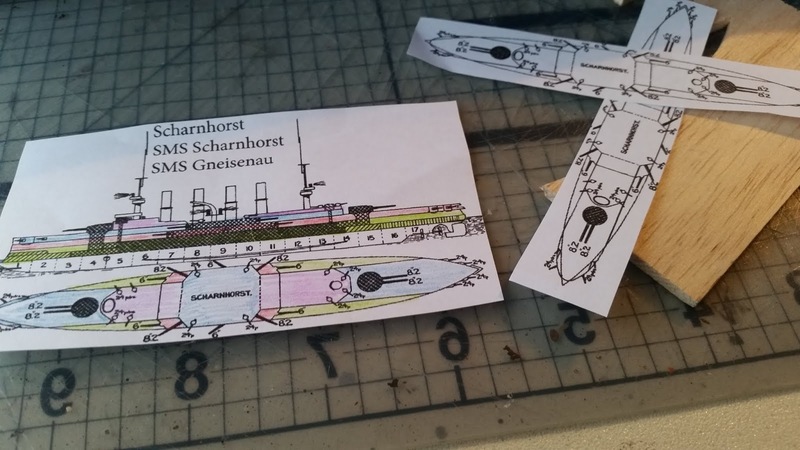 The colored bits on the plan is how I try and work out complicated layered decks, such was the case of the pre-drednought-era Scharnhorst-class armored cruisers. Next up, I cut out the hull pieces. 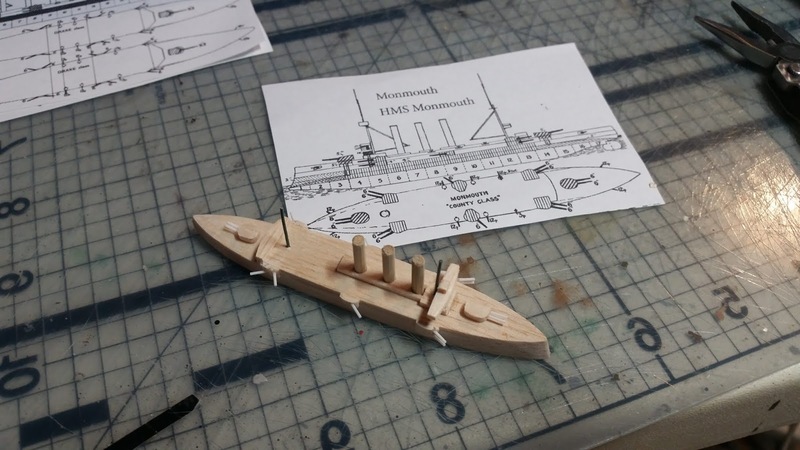 I gluestick a copy of the deck plans to the sheet of balsa wood. 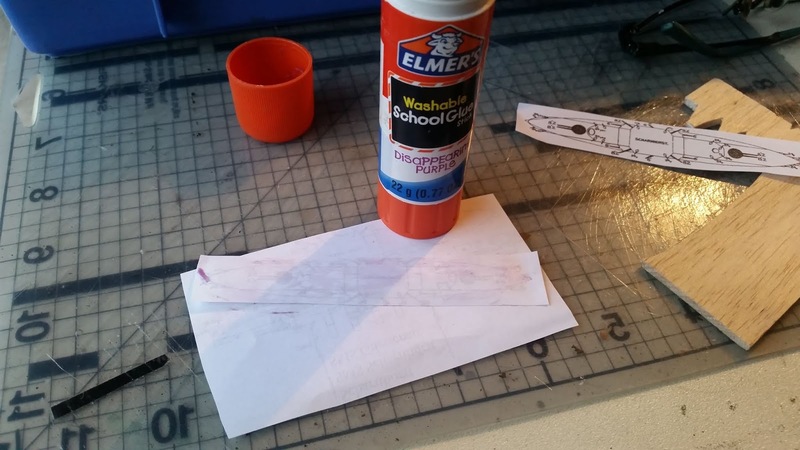 I use a low strength gluestick so I can easily remove the paper from the wood later to re-use in the case of multi-vessel ship-classes. Choosing the right thickness for the hull is important too, depending on how far you want the boat to settle in the water. I use the waterline plan to pick the right sheet thickness, measuring from the waterline to the top of the lowest deck. For dreadnoughts and battlecruisers, this is usually 3/16ths, cruisers are 1/8th and for destroyers I use 1/16th sheet. When cutting out the hull, I keep the knife at 90-degrees, taking several careful passes if necessary. I also trade out the blades often to keep a clean cut. 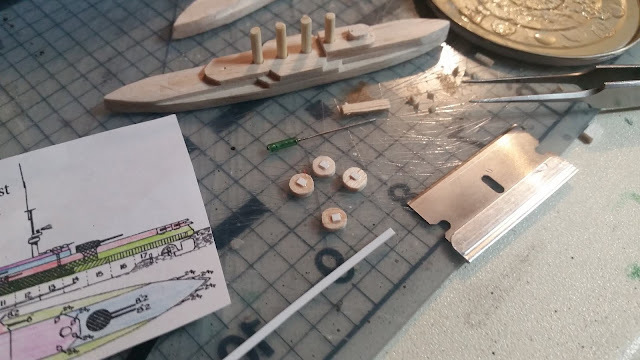 After the hull is cut, I use pin to poke a centering hole for each funnel on the deck plan (not pictured, sorry). After that I carefully peel up the plan from the hull. I repeat this process for each deck on top of the hull. I typically cut additional decks using 1/16th sheet. 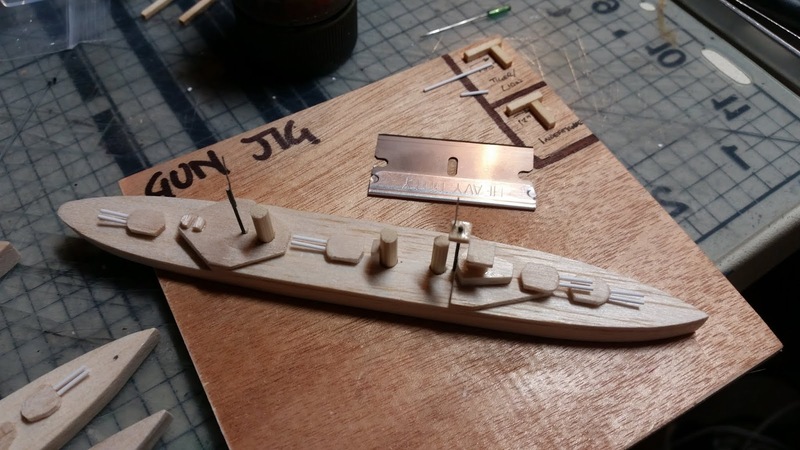 I carefully laminate the upper decks to the hull using superglue. You only get one shot at sticking them together so be careful! Its not a super big deal if there is some a small amount of overhang between the decks because I then sand the sides into a smooth side. I then use a file to drill out holes for the funnels. I have a variety of wooden dowels that I use for the funnels. I thought about using some sort of tubing, but I had difficulty finding a good combination of scale width and thickness, so I just decided to keep it simple and stick with wood. I primarily use bamboo skewers for the funnels on cruisers and for the smaller funnels on the larger ships. I used a proper 3/16ths dowel for the main funnels on the dreadnoughts. Some of the real funnels are more oval, but I simply abstracted that out for simplicity. 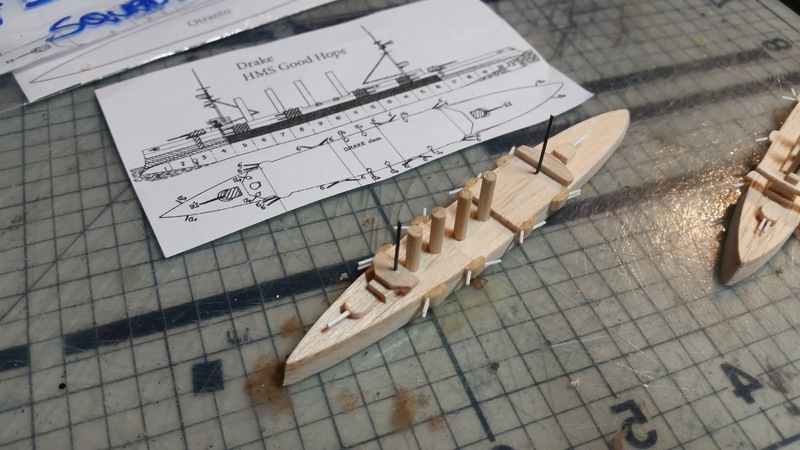 After setting the funnels into the hull, I'll give the keel a sand to get it all smooth. I then glue a little plasticard to the bottom of the turret to raise it up a little off the deck. 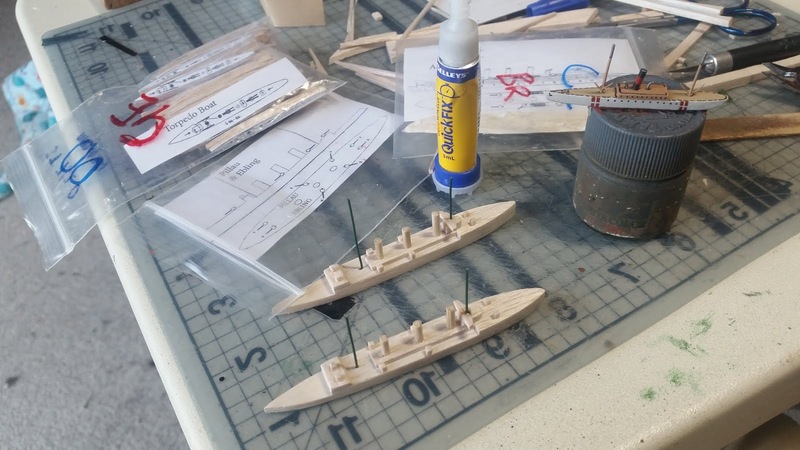 On my earlier models, I just glued them straight to the deck, which works for some turrets. However, I do like the gap the plasticard offers. Next I made a really simple T-shaped jig for cutting the guns. This helps keep each barrel the same length, which is handy when you have lots to do on a single ship and across different, but identically armed, ship classes. I used to not do this, and the mis-matched gun lengths really bothered me, so I re-gunned all of my first batch of ships. My jig now has all of the gun types from 7.2inch to 15-inch guns. The plasticard rod I use is .030" (.75mm) in diameter. 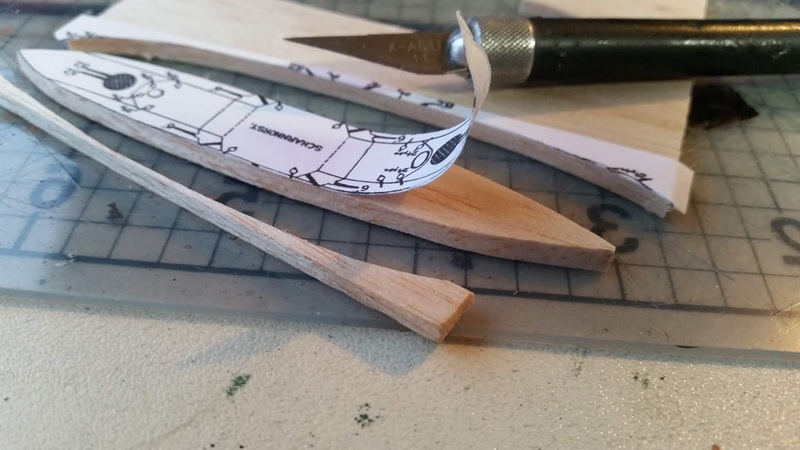 When cutting on the jig I use a sharp flat razor blade to cut clean and vertical. 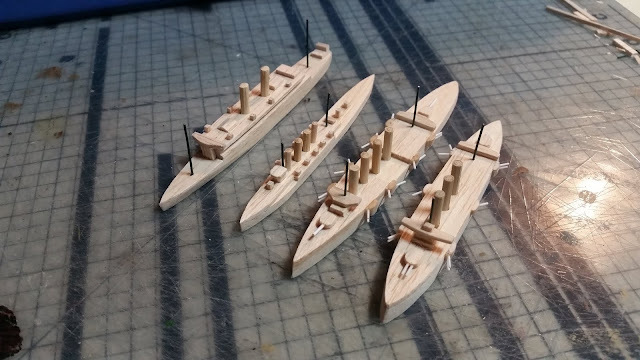 For 6" and smaller gun calibers, I just model the gunshields and casements, as shown here on these German light cruisers. I don't bother adding the guns, but they could easily be put on using broom bristles or some other thin monofiliment. 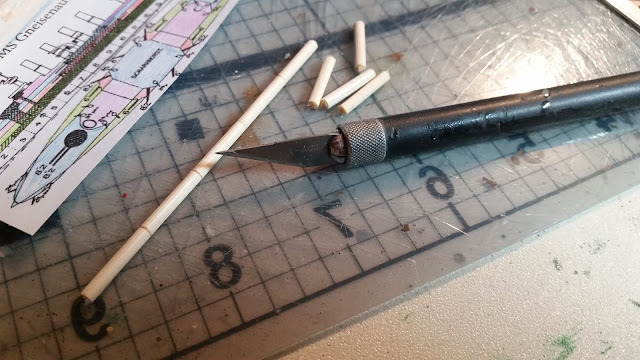 I cut 1/16th square balsa sticks and once again I use the jig to make sure that each gun emplacement is roughly the same size. 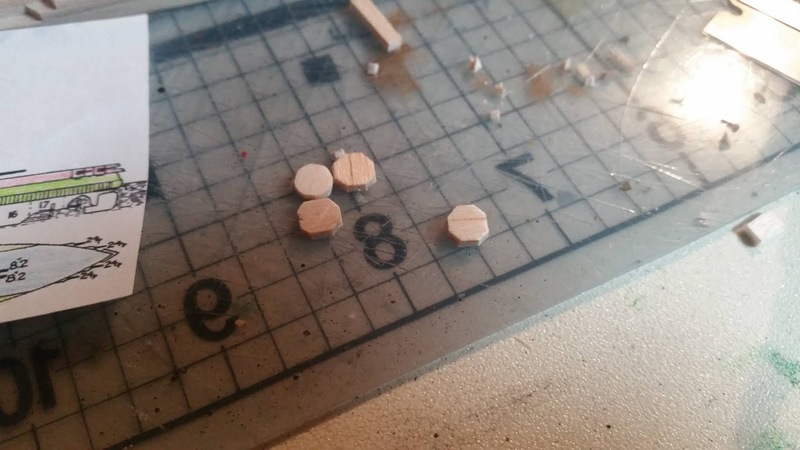 I tend to make them slightly taller than scale so that I can sand them down nice and flat at the right height. Finally, I add the masts. 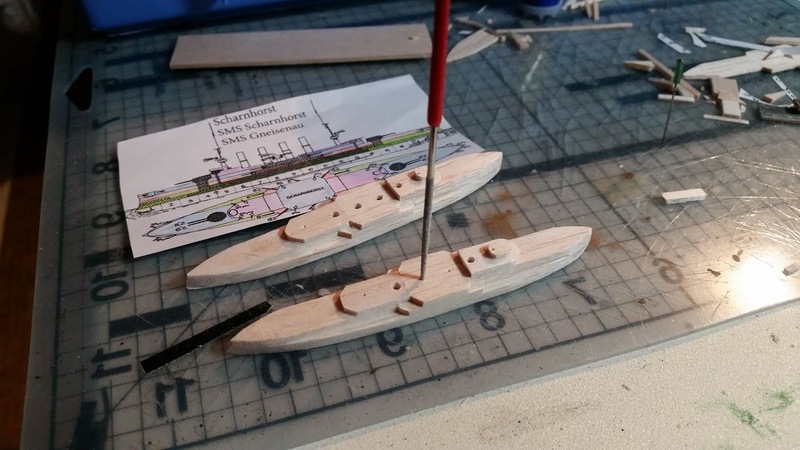 I have recently come up with a better solution for my masts, so have a look at that process here... For now, I've drilled wire anchor masts into the hull. I'm always knocking over ships by the mast and they tend to get loose, so I've started drilling through the whole ship, top to bottom. I then bend the wire into a "J" shape and push it up through the ship from underneath and then push the hook into the hull bottom. I give it a touch of superglue to seal it in and then sand the bottom smooth. Castemates are simply a bit of balsa that I glue to the side and then sand into a semi-circle. Sometimes you just gotta wing it. 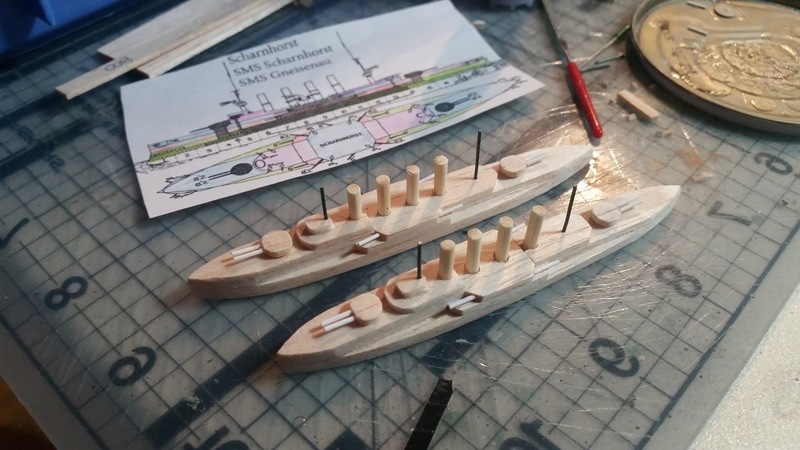 There's no deck plans for the HMS Oranto, which was an ocean liner converted into an auxiliary cruiser. In this case I used photos and guessed the shape of the hull based on the beam and overall length measurements. And that's about it for the build process. Each ship has its own challenges and that's a big part of the fun! I'll do some more tutorials around painting and detailing as well as document the mast process as I discussed above. Until then, thanks for stopping by and let me know in the comments if you have any questions or ideas for further articles! Thanks very much for this. I've made a bunch of AOS ships using a similar method. I will give your system a shot at WWI models. Also, laser cutters are available for use at our public library. I might try and incorporate their use to cut stuff out, we will see. Good call! 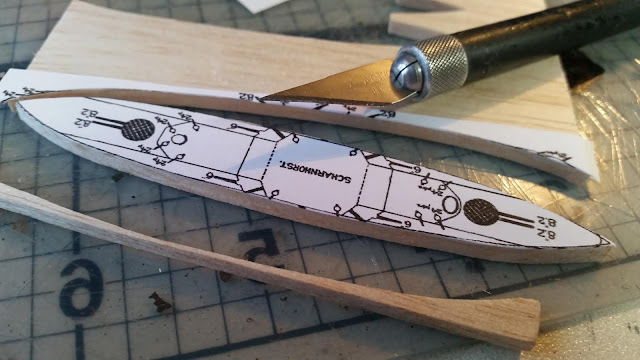 If I had a laser cutter, I'd definitely use that for the tedious parts! Looking for a copy of Janes WWI. Depending on the thickness of the lines in the drawings I may be able to simply scan them, edit a little, then laser cut. For the laser to cut the line thickness needs to be .001 inch thick. 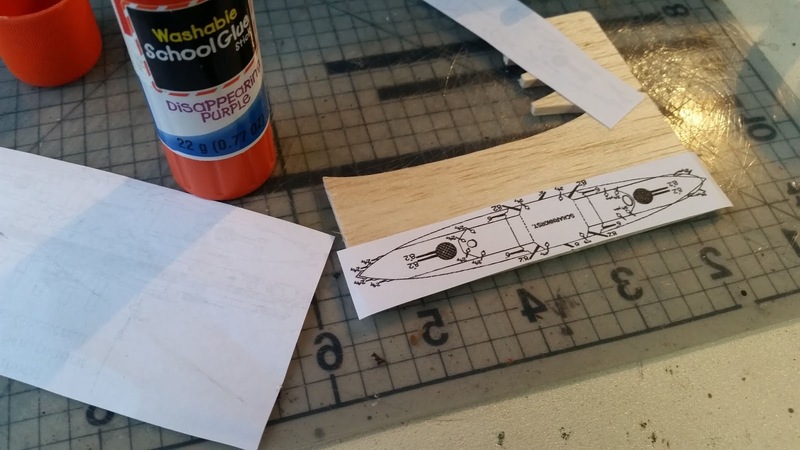 At that thickness or less the laser cuts, larger and it etches. 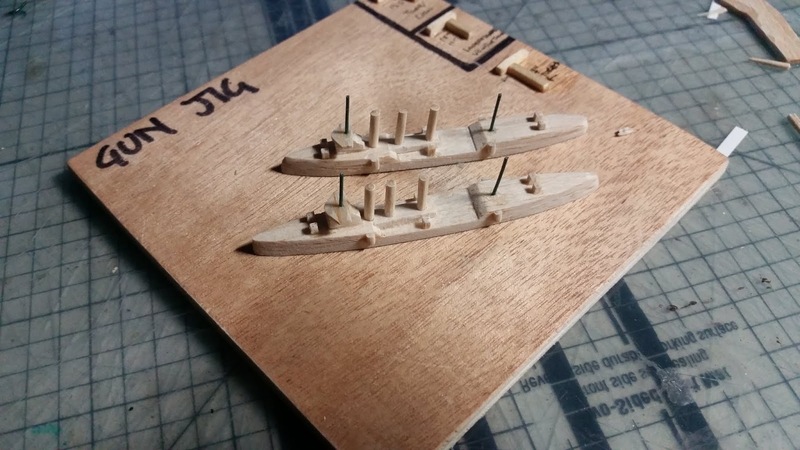 Hey Mike, Is it possible for you to send me a scan or two of a couple of ships that I could use for test purposes whilst I look for a copy of Janes WWI? That Monmouth you're working on looks interesting, but anything you like would do. If not possible no problem. And thanks for the tutorials. Your final product is just the thing I aim for when I do things. 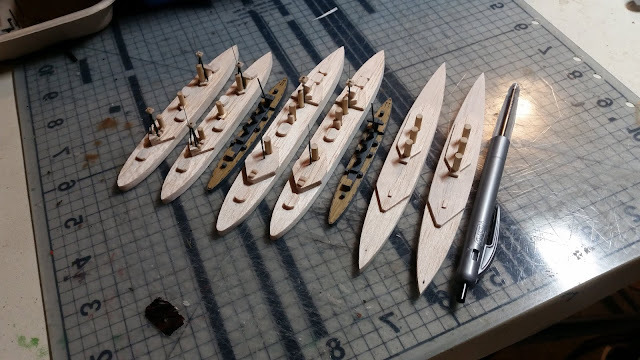 I'll have to send you a pic of the 1/72 scale Short that I made for WWI air games. Can I attach images here? Thanks very much Mike. I replied via your email address noted above. I look forward to trying things out. I've been following this project for a while, and it's great to see a "how to" article. Amazing article Mike, thanks! Can't wait to see these in the flesh! Nicely done! I really enjoyed this article. Mike, a link to a pic of my Short bomber, not sea plane version though. 1/72 scale. Not finished in pic but close.